Support for a Green New Deal is quickly becoming the climate litmus test for Democratic presidential hopefuls. In a CNN town hall on Monday night, Kamala Harris came out with the most full-throated endorsement of the plan to radically address climate change yet. The deal is a constellation of proposals championed by youth activists and endorsed by dozens of national Democrats, including Representative Alexandria Ocasio-Cortez. The ideas it espouses enjoy broad public support, though details still need to be hammered out. At the town hall, Harris referenced two of its central tenants: green jobs and environmental justice. On the green jobs front, Harris cited the Bureau of Labor Statistics, which lists wind turbine technicians and solar panel installers as the two fastest growing jobs in the country through 2026. She concluded her remarks by talking access to clean air and water as well as intergenerational justice. 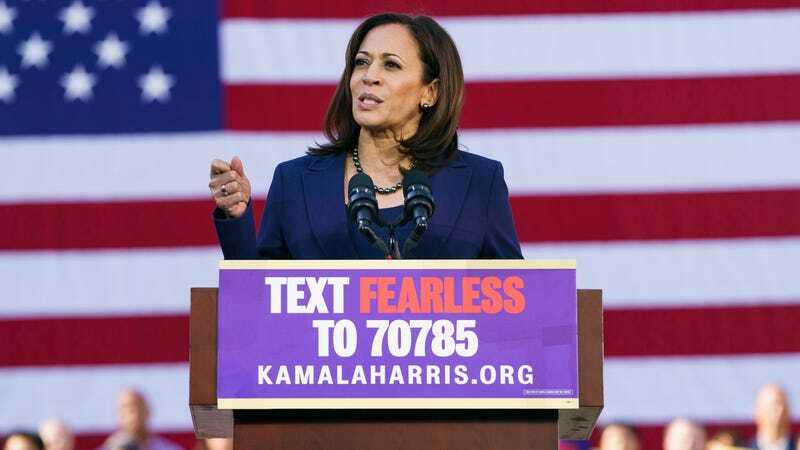 Among the presidential contenders, Harris’ words on Monday are the most ringing endorsement yet of the deal and why its needed. Elizabeth Warren and Kirsten Gillibrand, the two other major contenders who have announced they’re running for president, have endorsed the Green New Deal. But both have couched their support, with Warren saying she “supports the idea” and Gillibrand saying “the platform of it is really exciting.” The next day Gillibrand sent a letter to Senate Committee on Environment and Public Works Chairman John Barasso calling for “ambitious” investment in green jobs programs in order to decarbonize the economy “by as close to 2050 as possible,” which is fairly closely lined up with the Green New Deal. We’re still months away from the first debate but it’s becoming clear climate change is going to finally be a marquee issue after years of neglect that have brought the climate to the brink of catastrophe. On Sunday, protestors from the Sunrise Movement, a group of youth activists championing the deal, dropped a banner at Harris’ rally announcing her campaign asking her to support the Green New Deal. It’s unclear if that led Harris to come out swinging on Monday, but the group said it will keep the pressure up. Update January 29, 2:54 p.m.: A spokesperson for Gillibrand’s campaign reached out to Earther to flag her letter to John Barasso. This post has been updated accordingly.